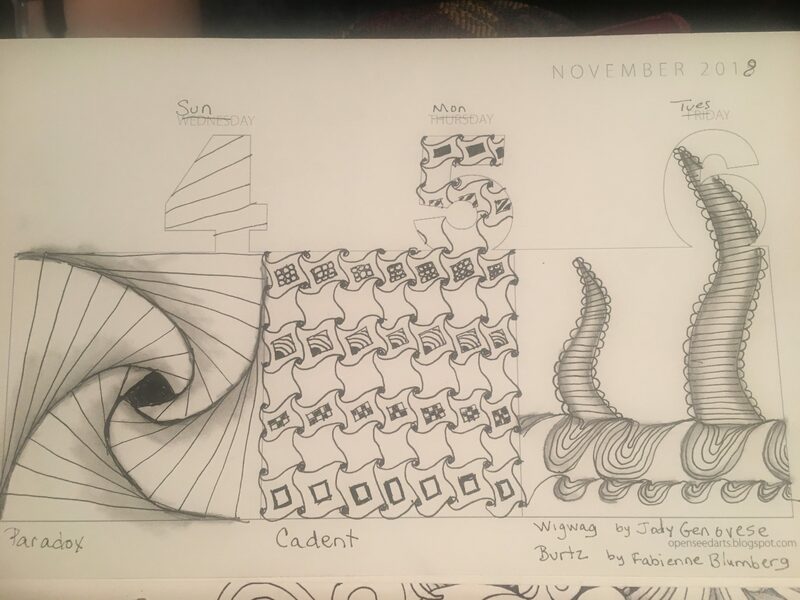 I really enjoyed doing a tangle a day throughout October. Here’s the last one where cruffle was the tangle. I “sliced” one open. And they kind of resemble hard candies or marbles. 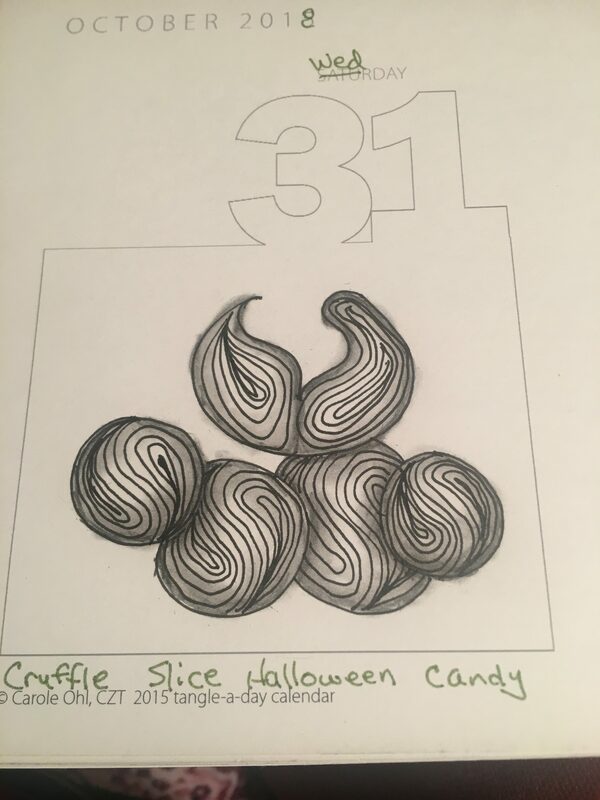 Since I already have the tangle-a-day calendar and I enjoyed the daily tangling, I decided to continue one in my 2015 tangle-a-day calendar and see how I do. I forget what challenge or tangle suggestion I followed to find Seespan, it may have been a tangle suggestion on Tanglepatterns.com; I like it. Suzanne’s directions made the ribbon effect easy to do. The next is Abeko which I did during Inktober and really enjoyed it. It flowed well and was easy to remember. Next to that is one I found on Patterncollections.com called cupcake flower. 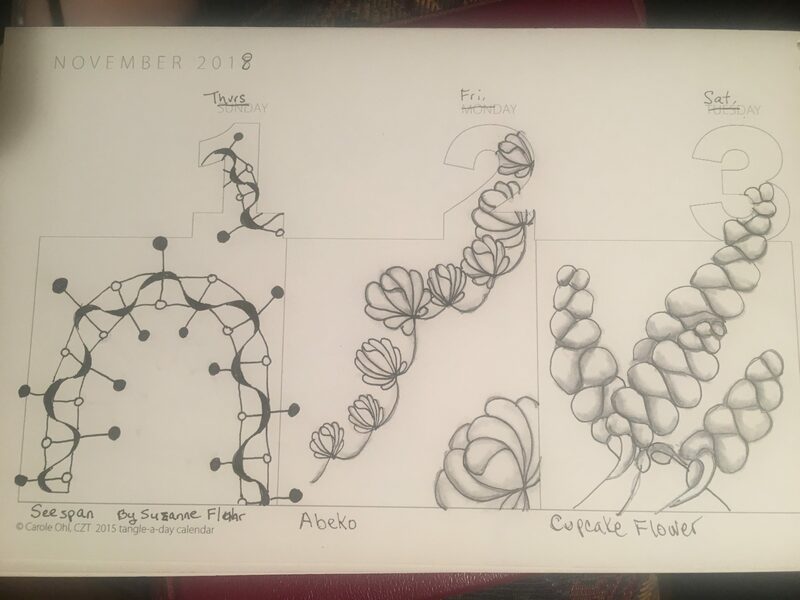 I learned this one earlier this year and have loved drawing it. It flows so nicely. Next is the fourth through sixth. I just pulled an old favorite out of my memory and out came paradox. Hmmm, looking at it online just now, I think I need a little graphite up into the four. I enjoyed tangling cadent on the fifth. It’s another favorite of mine. For some reason, I haven’t used it in quite some time, so I just filled the whole section with it. I still need to go back and do some shading though. Then next up is my submission for #DC375 using Burtz. It reminds me of tentacles. 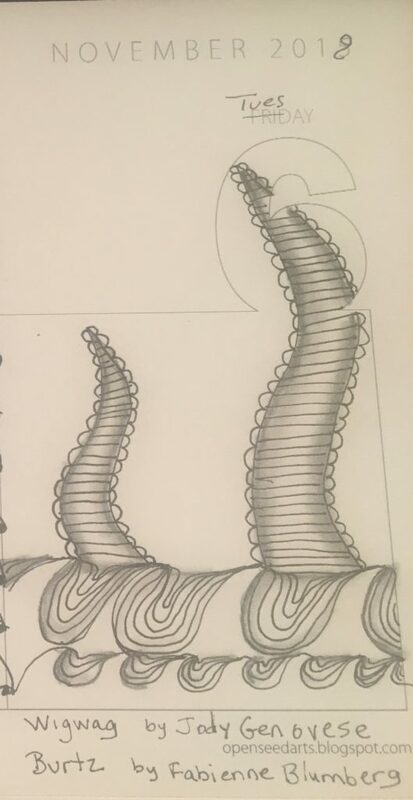 So, I thought it went well with the Square One: Purely Zentangle focus tangle of Wigwag, which looks like waves to me, in the stepout but here it seems to look more like branches and roots. Hmmm . . .
Well, that’s it from me today. I had a fun, busy day hanging with my mom. She treated me to lunch and then to Hobby Lobby, where I got to share with her the loveliness. It’s one of my happy places with it’s pretty household decor for sale, holiday decor, stickers, craft stuff, and WASHI TAPE. I love that you and your mom share the same interests… Although that might be dangerous if you encourage each other at a place like Hobby Lobby. (grin) Love your tentacles! It’s fun to play with an uncomplicated tangle to see what happens. I must have been sleeping. I didn’t see the ‘6’ behind Burtz and thought, oh, somebody took little bites out of her Burtz. Clever. Never saw seespan before, but now I have to try it! Nice burtz!